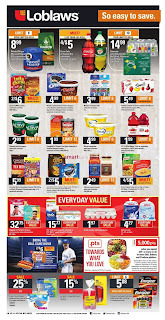 Browse latest Loblaws flyer extra savings must buy April 13 and 15 only for Easter products, coupons, beverage, snacks, convenient food, pantry, and top brands. Loblaws flyer Extra Savings Easter April 13 to 19 2017 You have one week to go with these prices of Loblaws weekly flyer. All checksouts open enjoy the fast lane! Loblaws meat and fresh fruit can find on page 2. Online shopping, easy pickup. Bakery, Cheese perfection, Best of Baby, Health and Beauty are available on page 11,12. You can get $5 Publix Gift card wy spend $20 on participating Unilever ice cream brands. Floral and garden on page 4. Check out fresh produce on page 3. Extra large greenhouse red, yellow or orange sweet peppers price 3.49 lb. 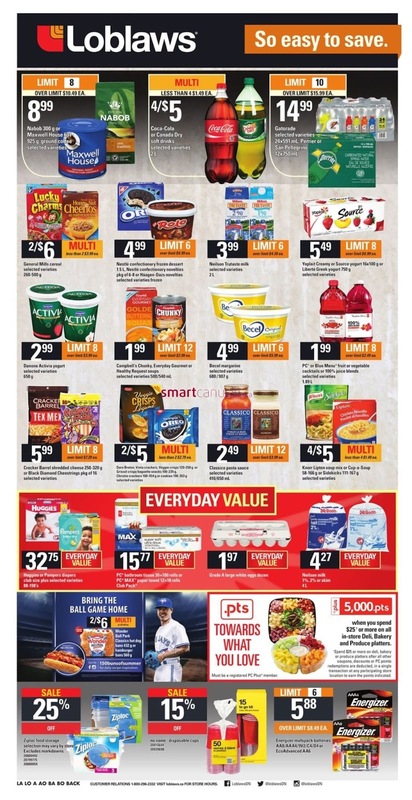 Loblaws flyer easy to save on last page including Nabob 300 g or Maxwell House 631 925 g ground coffe selected varieties price 8.99, Coca-cola or Canada Dry soft drinks price 4/$5, Gatorade selected varieties 24x591 mL, Perrier or San Pellegrino 12 x 750 mL price 14.99, General Mills cereal price 2/$6, Nestle confectionary frozen dessert 1.5 L, Nestle confectionary novelties pkg of 6-8 or Haagen Dazs novelities selected varieties frozen price 4.99 limit 6, Neilson Trustate milk price 3.99 limit 6, Yoplait Creay or Source yogurt 16x100 g or Liberte Greek yogurt 750 g price 5.49 limit 8. Everyday Value Huggies or Pampers diapers club size plus selected varieties 88-198 s price 32.75, PC bathroom tissue 30=100 rolls or PC MAX paper towel 12=18 rolls club pack price 15.77, Grade A Large white eggs dozen price 1.97, Neilson milk 1%, 2% or skim 4L, Ziploc food storage selected ay vary by store excludes markdowns price sale 25% off, no name disposable cups sale 15% off, Energizer multipack batteries price 5.88 limit 6 over limit $8.49 ea. .pts Towards what you love when you spend $25' or more on all in-store Deli, Bakery abd Produce platters.